There are many sites on the net which show and teach that how a candidate shall appear when going for an interview. But, sometimes there are certain silent factors as well, which if not taken care of can really affect the section of the candidate. So, here is the list of some of those factors that shall be taken care of. How to Blow a Job Interview? The body language of the candidate speaks a lot about the personality of the candidate. Whenever a candidate is appearing for an interview the interviewer has a rough idea whether the candidate is fit for the job or not. So, if the candidate appears with a bad body language, then his chances of being selected are reduced automatically. The handshake with the interviewer shall be done with confidence and firmly, but it shall not be done like that of a hulk. Handshake done with confidence is always good and presents the candidate in the good books of the interviewer, but always keep a check on the strength used to it. Whenever a candidate shows too many hand gestures while an interview is still going on, then it may cause a distraction for the interviewer and he shall not like it at all. Some, gestures shown by the candidate are acceptable, but too many gestures are hard to handle for certain interviewer. As a strong handshake is not welcomed same goes with the weak handshake. A handshake if weak will not only present the candidate as a weak person, but will lessen his chances of being selected. A handshake if not done properly will completely ruin the impression of the candidate. If a candidate shows disinterest in the job for which he is interviewing, then his chances of being selected are further reduced. For instance showing difficulty in relocation in the work area may make the interviewer think twice before taking the decision. If the candidate appears for an interview without the minimum research about the company, then he might not be able to answer the question asked by the interviewer. A candidate shall study the annual reports and certain other basic information about the company. If the candidate talks too much while the interview is going on, this may show some negative traits about his personality. The answer given by the candidate shall be to the point. The candidate shall be straight forward while giving the answer. A candidate shall act interested in the conversation with the interviewer. If he talks too little and does not get involved in the conversation and will not be able to express himself. The candidate shall express his opinion, only then his point will come across to the interviewer. If the candidate displays bad manners before the interviewer, this shows his disrespect for the interviewer and his non interest in the job. By doing this the candidate will appear a complete misfit for the job. During the interview a candidate shall not be busy with his phone and he shall keep his phone on silent mode. If the candidate is busy with the phone the interviewer may get annoyed and call off the interview then only. When a candidate has to appear for an interview he shall dress according to the dress code for the interview. If the candidate does not dress properly, then he shall be disqualified immediately. The candidate shall not be arrogant towards the interviewer. Being arrogant may work against the candidate and his chances of being selected may reduce greatly. The candidate shall not speak bad about the previous employer because by doing this the candidate shall present his bad image in front of the interviewer. This might act against the employee and he shall not be able to get the job of his choice. The candidate when cross questions the interviewer he shall do it smartly else it might work against him. Questions if asked smartly and to the point can show a candidate’s intelligence else they will show arrogance in his nature. If the candidate appears late for the interview, then this raises question on his punctuality. A candidate shall be present for the interview `15 minutes before the scheduled time. Today’s business world has employees who are properly dressed and are in full swing with the fashion trends. So, it is very important for the candidate to smell good when he goes for an interview. If the candidate does not smell good, then the first impression might fail on the employer. The resume of the candidate shall be appropriate for the job being applied. The resume shall provide all the necessary information that the interviewer might be looking for. This way all the confusion about the candidate will be avoided. If the candidate links personal and professional lives, then this might not be liked by certain employers and on this ground they may even reject the candidate from being selected. If the candidate shows lack of enthusiasm for the interview, then it may seem to be forced upon him. The candidate shall take an interest and participate in the interview in every possible way. An interview is always ended by the interviewer. A candidate never ends the interview by saying the final word or saying that he is running out of time. The interview shall appear as the most important meeting for the candidate. If both the interviewer and candidate don’t discuss about the further proceedings after the interview, then either of them is not interested in the job being given or accepted. They shall discuss about the next step once the interview is over. General courtesy says a candidate shall send a thanksgiving message to his interviewer for taking time out of his busy schedule and interviewing him. This is generally not done by many candidates and thus the interviewer avoids taking interviews. If the candidate uses inappropriate language during an interview, then what impression will it create on the interviewer. This way a candidate will show unprofessional behavior towards the work environment. If the candidate keeps boasting about his accomplishments, then this might not be liked by the interviewer. Too much talking about his own self will make the candidate appear as self obsessed and the interviewer will not take much interest in such a candidate. A candidate shall never try to get the job by telling sad stories about his past. A candidate shall always try to get the job by his eligibility and intelligence. Job given due to bad experiences in the past might be taken away easily. If there is any question asked by the interviewer about which the candidate does not know the answer, then it’s better not to give answers than giving wrong answers. Giving the wrong answer will give a bad impression on the interviewer. What to Do if You’ve Blown a Job Interview? Whenever a candidate blows a job interview he will surely have the idea of the same. The interviewer is also a human being and will surely understand that every human has a bad day. So, here are certain things that the candidate can do if he has blown a job interview. A candidate can send a thank you email to the boss and can explain the boss that the candidate can surely have done better stating the reason of distress. By doing this gesture the boss will surely take into consideration the whole thing. A candidate can surely explain the boss that how interested he is in getting the job and will surely like to join it if given a chance. The candidate can explain all the preparations he has done for the job and will understand the situation. The candidate can ask for a second chance from the interviewer. By doing this he can show all his skills to the interviewer and can explain his ability and eligibility to the interviewer. If a candidate does not get a chance for the second interview, then he can ask for the option of the phone interview from the interviewer. If the candidate is lucky he will get the chance of phone interview from the interviewer. The candidate shall say sorry for what has happened during the interview. By doing so the candidate will show his etiquette and will be offered a second chance too. 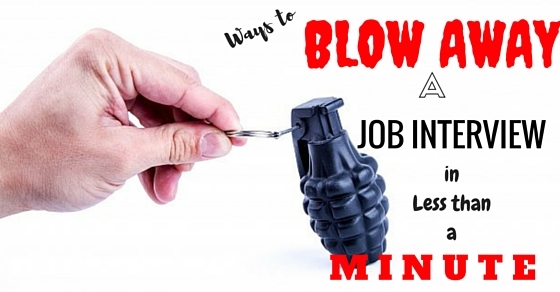 How NOT to Blow a Job Interview? Although appearing for an interview is an experience of a lifetime for the candidate and he wants to excel in it, but still there are certain ways by which he can have an extra edge over the other things. Here, is the list of certain things which the candidate shall keep in mind while going to appear for an interview. The interview shall be scheduled according to the time that suits the interviewer and not the candidate. In such a situation the interviewer will feel relaxed and will judge the candidate with free mind. A candidate while giving answers during an interview shall try and answer according to the age of the interviewer. People in different age groups are pleased with reasons for the same answer. The candidate shall try to impress the interviewer by praising the work done by the interviewer and all his accomplishments. He shall also highlight the achievements of the company and show his good will to be able to join the company. A candidate shall show confidence when he answers any of the questions asked by the interviewer, but at the same time he shall keep in mind that he does not reflect over confidence in his personality. The candidate shall always highlight the ways he has handled the problems in the previous job because this will highlight his ability to deal with the situation and the other employees working in the company. A candidate shall never hide his weakness, if any from the interviewer. If he does so and presents himself as a complete package, then he might face problems in the future. A candidate shall express himself with full confidence and freely. By doing so he will be able to present his views in a better way. Also, the interviewer will be able to take decision in a better way. The candidate shall make eye contact with the interviewer as it will show his confidence and will make him stand apart from the others. The candidate shall highlight all his skills in the best possible manner. This will stand him apart from the other candidates who have applied for the job. So, a candidate shall keep all the above points in mind when he will be appearing for the interview. By doing so he will definitely get the job and would excel further.